We do math a lot. Like almost every single waking moment of the day. Like to the point I have to ask J to stop asking me so many math questions. His hypernumerate brain just keeps going and going. So I come up with lots of simple math activities to help quench his thirst for more math. Sure he's been skipping counting by obscure numbers for as long as I can remember, but sometimes he just needs the easy math games to keep him busy and happy. These DIY math cups are just one of those simple math boredom busters that I whip up for him. They're great for practicing skip counting by 2s, 5s, 10s, or even 25s. They're also great for practicing greater than and less than statements. I made a whole bunch of them. Enough so that he could skip count by 2s up to 100, by 5s up to 100, by 10s up to 100, and by 25s up to 100. I didn't make every single number from 1 to 100. I'm not that ambitious. I also made some greater than and less than signs. J is particularly fascinated with greater than and less than statements lately. Perhaps not as much as he loves fractions, but definitely a contender for his favorite type of math. He liked to set up the math statements horizontally and, sometimes, he would stack them into a tower. And, of course, he did lots and lots of skip counting. 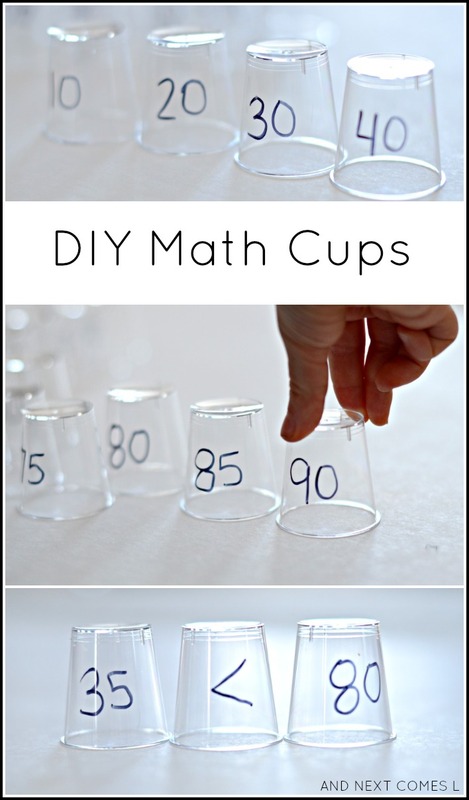 These DIY math cups make multiplication visual. I can ask J, "What's 5 x 6?" and he will count out the first 6 cups in the sequence. Not that he needs to even count them out. Pretty sure he's known the answer to that multiplication question for over a year now, but, regardless, it's a great way to make math more hands on and visual. Try out these DIY math cups on the light table or try learning how to tell time with this math cup variation. Thanks for stopping by, Lora!